Many women who end up transporting drugs are co-opted by networks that use similar methods to those employed in human trafficking crimes. That is what happened to Liliana, a Venezuelan woman with two children who agreed to transport drugs under the threat that her family would be harmed if she refused. 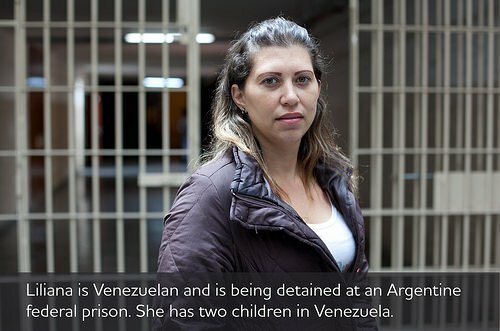 She is incarcerated at an Argentine federal prison and her children remain in Venezuela. This photo essay is published as part of an editorial partnership between openDemocracy and CELS, an Argentine human rights organisation with a broad agenda that includes advocating for drug policies respectful of human rights. The partnership coincides with the United Nations General Assembly Special Session (UNGASS) on drugs.